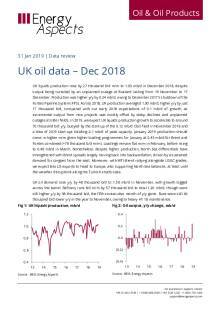 UK liquids production rose by 27 thousand b/d m/m to 1.03 mb/d in December 2018, despite output being curtailed by an unplanned outage at Buzzard lasting from 19 November to 17 December. Production was higher y/y by 0.24 mb/d, owing to December 2017’s shutdown of the Forties Pipeline System (FPS). Across 2018, UK production averaged 1.00 mb/d, higher y/y by just 17 thousand b/d, compared with our early 2018 expectations of 0.1 mb/d of growth, as incremental output from new projects was mostly offset by steep declines and unplanned outages at older fields. In 2019, we expect UK liquids production growth to accelerate to around 70 thousand b/d y/y, buoyed by the start-up of the 0.12 mb/d Clair field in November 2018 and a slew of 2019 start-ups totalling 0.1 mb/d of peak capacity. January 2019 production should come in higher m/m given higher loading programmes for January at 0.43 mb/d for Brent and Forties combined (+78 thousand b/d m/m). Loadings remain flat m/m in February, before rising to 0.46 mb/d in March. Nonetheless, despite higher production, North Sea differentials have strengthened with Brent spreads largely moving back into backwardation, driven by a sustained demand for cargoes from the east. Moreover, with WTI-Brent rallying alongside USGC grades, we expect less US exports to head to Europe, also supporting North Sea balances, at least until the weather disruptions along the Turkish straits ease. UK oil demand rose y/y by 48 thousand b/d to 1.56 mb/d in November, with growth logged across the barrel. Refinery runs fell m/m by 57 thousand b/d to total 1.20 mb/d, though were still higher y/y by 38 thousand b/d, the fifth consecutive month of y/y gains. Runs were still 40 thousand b/d lower y/y in the year to November, owing to heavy H1 18 maintenance.